Smoke detectors need to be wired together to create a complete system. 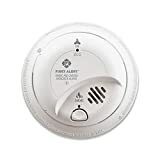 With hard-wired detectors, a single smoke detector going off will set off the others — ensuring that everyone in your home is alerted to hazards. Hard-wired detectors are also able to run off both power and batteries, making them extra secure. They can also detect home-wide threats such as carbon monoxide that could otherwise go completely unnoticed. Nevertheless, because they deal with electricity, you need to be very careful when installing them. A voltage detector. This will protect you by ensuring that you aren’t working with live wires. A wire stripper. Wire strippers are used to remove the outer casing of a wire so it can be connected. Wire connectors. You need 3 wire connectors per alarm — many alarms will come with them, so check the box. 12-2 NMB and ground wire. 12-3 NMB and ground wire. 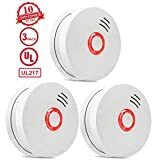 Understandably, the main difference between a wired smoke detector and a battery-powered smoke detector is that a wired detector connects directly to wires in your walls. Whether you’re simply replacing existing detectors or creating a new network, you’ll need to know how to connect a wire. Connecting a wire is done by stripping approximately 1/2 of an inch of wire at the very end and then placing the two wires to be connected into a wire connector. The wire connector is then twisted until both wires are held firmly within. This creates a safe and solid connection. Once the connector has been screwed down, no wire should remain exposed. If your fire alarms are installed incorrectly, they can actually become a fire hazard. And while the irony may be fun, the consequences won’t be. If you’re uncertain at any time during this process, consult a professional. Turning the power off in your home. You can do this by switching all of the circuit breakers to the “off” position. Use a voltage detector. Make sure the power is off to the wires. Disconnecting the old alarm. Remove the old alarm: there should be a black, white, and red wire. Connect the new alarm. Black goes to black, white goes to white, and red goes to red. Mount the new alarm in place using the mounting brackets included by the manufacturer. Turn everything back on and press the test button of your alarm. You can then reset it after it has gone off. There’s only one caveat: you may find that your old alarm only had two wires. Simply connect the wires that exist and leave the last one unconnected. If you don’t have a setup, you’ll first need to mark off areas for your smoke detectors. Detectors are generally mounted on ceilings or at the top of walls. Use the cut-in box of the smoke detector as a guide; mark off an area and use a drywall saw to cut around it. Turn off your power completely before attempting to connect your smoke detectors. Every time you work with wires, you should check them with your voltage detector first. When running wires, you will need to get into your walls and ceiling — which may require some specialized equipment, flash lights, and other tools. You should also be careful to avoid disrupting other electrical wires, HVAC systems, and structural features. A 12-2 NMB with ground wire will need to be run from your electrical panel to the first smoke detector. From there, a 12-3 NMB wire will need to be run to the second detector, and so forth to each subsequent detector. When making the connections, black wires should be wired together and white wires should be wired together. Any red wires should be connected to the interconnect wire with the smoke detector, which is usually a yellow wire and should be listed in the manufacturer’s manual. Once the electrical wires have been attached, you can strip the ground wire and connect it to the ground bus. Once you’ve completed connecting your wires, you can turn on your breakers and test the smoke detector. When turning on your breakers, you should stay as far away from the panel as possible and look away, as it can be dangerous if there are issues. Your smoke detectors can then be tested and reset. Wiring smoke detectors together is relatively simple, but because it does involve electricity it can be very dangerous. This guide is not intended to replace manufacturer’s directions and the manufacturer’s manual should be carefully reviewed before installation. 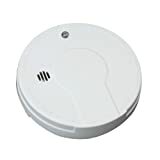 Different smoke detectors may have different setups, such as the way in which they mark their ground bus or their interconnect wires. It’s important to follow these directions and any diagrams and labels that are included.